The US State Department has given its support to the military operation undertaken by Kiev in Donbass. Jen Psaki, spokesperson for the US Department of State, stated that Kiev has the right to secure order and peace on its territory. How Ukrainian authorities secure order and peace, Jen Psaki should ask the people of Donbass. But Western journalists prefer not to speak with the people living in the war zone. 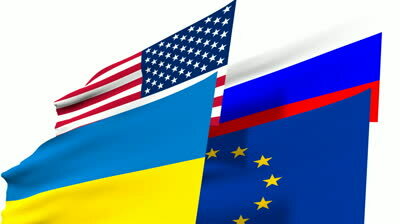 They avoid citing any word which could cast doubt on Kiev`s policy. On the other hand, they easily rely on official Ukrainian sources and repeat their false, office-made “news” about Russian aggression and rebels killing their own population. Although only insane people would kill those who give them food and other support, a support essential to the Donbass guerillas, the myth about rebels killing their own families is still alive. If Westerners could see what is really going on in Donbass, they would have a completely different picture. Plenty of videos can be found on various websites showing dead civilians, slaughtered by Ukrainian artillery or aviation. On the videos, survivors say clearly that people are being killed by Ukrainians from Kiev and not by the rebels. But pro-Kiev media and its Western allies turn a deaf ear to their sufferings. After the Lugansk administration building was bombed by a Ukrainian aircraft on June 2, it became clear to all that the pro-Western government in Kiev was ready to cross the red line. Here is a video taken just after the bombing. Among the victims were several women and the video shows them still alive but mortally wounded. On July 27, after the bombing of Gorlovka, there were as many as 30 corpses in the streets. Among them were a 23-year-old mother embracing her little daughter, as witnessed in this video. Here one can see the aftermath of the Ukrainian bombing of civilian neighborhoods near Lugansk on August 15: two old ladies torn apart by missiles from Kiev. Their companion tells the cameraman the details of their death: the women didn`t manage to reach the basement in time, where locals habitually hide from the “Ukrainian liberators”. Four days later a similar event took place: at least five residents of Makeevka near Donetsk were killed by Ukrainian bombs. Here are the victims of the Ukrainian bombing of Zugres, in the Donetsk region: a van full of corpses including a five year-old child. And here is the result of another bombing in Donetsk: women and children are regular victims of the Ukrainian army. Such events have become part of everyday life for the inhabitants of Donbass. Independent cameramen are trying to bring the truth to the Ukrainian and Western public but this is no easy task. Firstly, it is very difficult to publish the videos, because internet connection is now a luxury for Donbass. The Ukrainian army has destroyed not only electricity plants but water pipes and gas lines as well. Secondly, Ukrainian forces are arresting journalists and people making videos, and treating them as criminals. Kiev has unleashed a real war against freedom of speech. Any video or text criticizing the Ukrainian government is considered as “support for Donbass terrorists.” Making such videos means risking your life or freedom. This affects journalists beyond Donbass as well. The Security Service of Ukraine (the equivalent of the American FBI) pays regular visits to intractable reporters and throws them in prison with no scruples. Recently my empty apartment in Kirovograd was visited by agents of the Security Service of Ukraine. I was lucky enough to be in Russia but my neighbors were questioned about me. The desire to smash any kind of resistance in the country has become an obsession of the Ukrainian authorities. The declaration recently made by the head of Ukrainian Officers’ Union, Evgeniy Lupakov, where he said he wanted to hang the “Donbass terrorists” on street poles, is of utmost importance and direst foreboding. Will peace come to Ukraine? Will Ukrainians be able to freely express their opinion? The future will tell. Vladislav Gulevich is a Ukrainian journalist and political analyst who has recently fled to Russia. He can be reached at [email protected].